Acceptance, inclusion, and the day to day journey of a family and their Autistic Child in the Neuro-typical (NT) world. As NT’s, we prefer speech, but we need to be aware of the cost to those we love and work to find what works best for THEM. Honestly, a little understanding goes a long way. I would like to say something about my Autism Diagnosis and my social issues. I did not suddenly become Autistic on the day that I was diagnosed (as an adult). I have been Autistic since the day that I was born. I was very well aware that I did not “fit in” well with most other people. I sometimes even told people that, even though I am polite and know to say “please” and “thank you,” my social skills are “poor.” I knew that I didn’t understand the social rules, no matter how much that I tried, and I admitted to having “bad social skills” to people before my diagnosis. “People do not believe me” was what Emma wrote on our last day in Texas last week. Prior to that sentence she wrote a message to Richard and me that left me in tears because it expressed her gratitude for believing in her and for fighting for her right to be thought competent and intelligent. One day my daughter will be able to write what she feels and believes independently, of this I have absolutely no doubt. When that day occurs, she can choose what and when she wants to write such things, but for now, I will keep this post to my own views and opinions. Once upon a time I wanted to write a post about conflicting desires. Specifically, about my desire to fit in and pass for normal, but also my desire for people to recognize and remember that I’m different. I have a note on it sitting in my list of possible blog topics to write about. My desires, however, are getting less and less contradictory as time goes on. Oh, sure, I can get tired of my constant status as outsider, of the fact that I never really feel like I’m part of a group… but “outsider” is increasingly part of my identity, and I have found that sometimes I am more a part of a group than I perhaps had thought. Well-meaning… still getting it wrong. I can’t mind-read. But I have watched this happen, again and again. They all seem to know that ‘lack of eye contact’ is a marker for autism. Is it really so hard to imagine that it might not actually mean Nemo is not listening? What’s up with the blind spot? 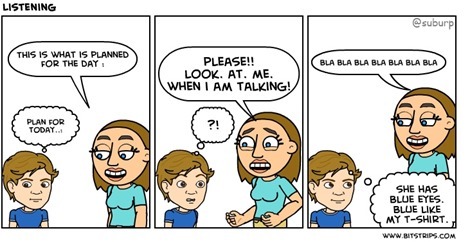 Mommy, do I have autism? Is Verbal Communication Really The Ideal?